Italian Violins and Fine Bows | Fine Musical Instruments Auction at Skinner | Skinner Inc.
BOSTON, MA – March 17, 2014 – Skinner, Inc., the only American auction house hosting in-person sales of exceptional, high-quality instruments, will present an auction of Fine Musical Instruments on November 9, 2014. A fine Italian violin by Giovanni Francesco Pressenda leads the auction, which includes over 300 lots of violins, violas, cellos, and bows along with fretted instruments and woodwinds. Giovanni Francesco Pressenda was perhaps the most important Italian violin maker of the 19th century and certainly is considered among the very best of the Turin school. He modeled his instruments closely on Stradivari while introducing personal touches. Skinner is proud to present a violin made by the revered luthier around 1835, and labeled Joannes Franciscus Pressenda (Lot 20, Estimate $180,000 to $220,000). A professional musician has played on this instrument since graduating from Julliard, and has decided that it is time for the violin to find its new caretaker. Jill Arbetter, Director Pro Tem of Fine Musical Instruments, says, “Pressenda is very popular among players right now. People are out there looking for these instruments, and we’re very excited to offer such an excellent example.” Yulia Ziskel, a violinist with the New York Philharmonic Orchestra, played the violin, and found it to be a beautiful instrument with deep, dark sound. Joseph Gagliano is another important Italian maker represented in the auction. A classic example of his work, the violin was made in Naples in 1783 (Lot 290, Estimate $15,000 to $18,000). The auction also features a group of modern Italian violins featuring the luthiers Carlo Badarello and Mario Bedocchi (Lot 19, Estimate $10,000 to $14,000), as well as violins, violas, and cellos by American makers. A viola by Frederick Haenel (Lot 292, Estimate $12,000 to $15,000) leads the selection of modern American instruments. The Stanley family, Frank Ball, Knute Reindahl, and Karl Berger are also represented. 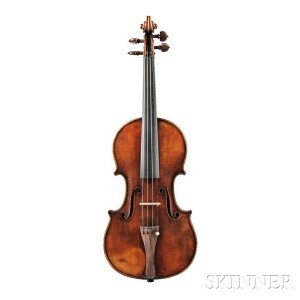 The auction features a broad selection of high-quality violin, viola, and cello bows. Highlights include several French silver-mounted bows: a cello bow by André Richaume (Lot 47, Estimate $5,000 to $7,000), and violin bows by Lupot, Caressa, and Ouchard. Two English bows by W.E. Hill & Sons will also be offered. An alto saxophone and b-flat clarinet, both by Henri Selmer, will be presented together along with a specialty case built exclusively for both instruments (Lot 120, Estimate $3,000 to $4,000). The clarinet is virtually unplayed. Guitars and other fretted instruments will also be offered. For the first time, the Boston-based performing group Emmanuel Music will perform at a Skinner auction preview. Join us for the Musical Salon on Saturday, November 8, 2014 from 5:30 to 7PM at the Skinner Boston Gallery. The event is free and open to the public. In addition to the Musical Salon, Skinner will open its doors to musicians and enthusiasts interested in handling and playing the instruments presented in the auction. Open preview will be held on Friday, November 7 from noon to 7PM, on Saturday, November 8 from 10:30AM to 5PM, and on November 9 from 9AM to 10AM. Illustrated Catalog #2717B is available from the Subscription Department, at 508-970-3240, or from the Gallery. Prices realized will be available online at www.skinnerinc.com, both during and after the sale. The Skinner website enables users to view every lot in the auctions, leave bids, order catalogs and bid live, in real-time, through SkinnerLive! This entry was posted in News and tagged American violin, cello, cello bow, fine violin, french bow, Gagliano, German bow, guitar, Italian violin, Jill Arbetter, modern violin, music, Musical Instruments, Pressenda, saxophone, skinner, stringed instruments, viola, violin, violin bow by Skinner. Bookmark the permalink. Do you have access to a C>J>P Collin-Mezin 1899 violin. If so can you please send me descption and photos and suggested price. Thankyou.